We all know that insects are a vital part of our environment. But at the same time, it is worth noting that some of these bugs tend to cause a lot of harm to trees and plants and therefore may need to be kept under control. We list down different bugs that can harm or kill trees and plants in the Rocky Mountain region. Read on. This aggressive beetle is renowned for its destructive nature, characterized by major pitch tubes on a tree’s bark. Outbreaks usually happen in mature forests. 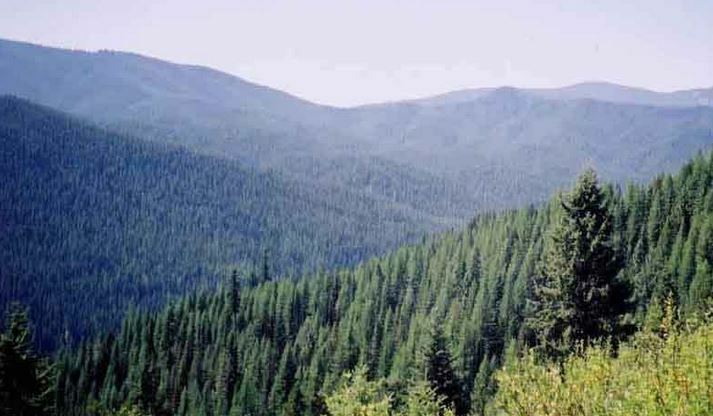 One sign of mountain pine beetle infestation is gradual fading of trees from yellow-green to red-brown. You can easily tell that a tree is a host of this beetle mainly because you will find woodpeckers digging beneath the barks for larvae. The dark-brown cylindrical insect has been cited as a cause of destruction of lodgepole pine trees in Rocky Mountain National Park since 1996. This is a dangerous foliage attacker that has made willows, wild cherry, apple, pear, hawthorn and plum trees its preferred residence. You will find colonies living in conspicuous nests during winter from where they create unsightly silky tents. As the family grows, so does the demand for food – which then means the host tree is stripped off all its twigs. Fortunately, despite weakening trees, these cocoons hardly kill them. The Colorado State University categorizes it as the most destructive insect pest of plum, cherry and other fruit trees. This is because the borer hides under the bark of trees creating massive gouges (also affects upper roots of living trees). Its young larvae dig into the sapwood of the tree causing wounds in the bark. The harm is usually massive during warmer weather as the larvae have to feed more before reaching pupa stage. This is not your ordinary moth – it has reddish brown forewings and white hindwings. It spends most of its time around pine trees producing larvae (caterpillars) whose hair causes a skin rash when it comes in contact with some people. While the moth is blamed for the bulk of harmful effects, the larvae is actually the main culprit because it feeds extensively on foliage. This can cause significant injuries if left unchecked although permanent effects are rarely reported. Every April, an army of these marauding creatures emerges creating punctures around trees as it feeds. Two months later, they hatch eggs thereby giving way to formation of larvae, which kill terminal shoots causing loss of 2 years of growth. It’s easy to tell when a tree is under terminal weevil attack as the top begins to droop in midsummer. Unlike their namesakes (spiders), spider mites eat plants as they are herbivores, not carnivores. They usually devour host plants by piercing and sucking out the fluids – this gradually causes browning or yellowing of leaves. Besides doing that, they create webbing that not is not only unsightly but also can damage the plant leaves. It’s even more challenging to deal with these spider mites because they tend to be fuelled by use of insecticides and fungicides which may kill other organisms that keep the mites under control. This is by no means an exhaustive list of bugs that can cause permanent harm or even kill your trees/plants. Different weather patterns, foliage and even tree age may determine the kind of insects that attack. If you have specific questions or notice an infestation, be sure to call your local tree service, if you are in the Denver area feel free to contact TreeRemovalDenver.net at 855-335-1596. The next time you are out enjoying that breathtaking landscape beauty or basking under a shade on a hot summer afternoon, remember exactly what trees provide for you and the entire planet. Not only do they purify the air, but they also boost property value, offer shade-blocking UV sun rays, cool the environment and better yet provide food. Their importance and benefit stretches far and wide covering our environment, economical and emotional aspects which is why it is crucial to remember that they constantly need attention. It is essential that all trees receive sufficient protection from the looming menace of tree diseases. They are especially devastating and if by chance they are left untreated, they can spread throughout an entire plantation. Among the most prominent diseases is the Bacteria Wetwood which unfortunately comprises several strains. It attacks multiple shades of trees and leaf types. Wood-colour trees that have been affected by this disease often change and assume a brownish yellow rotten state that forms around the tree’s center. The wood produces gas and toxic ooze which inhibits healing and growth. Extra care should particularly be adhered to on spotting “alcohol flux” a characteristic white froth that comes with advanced cases. This disease attacks tree barks where it creates rings around the trunks and branches. When Canker progresses, its girdles kill all tree-parts above the typical ring created. For most trees, their likelihood of contracting this fungus is particularly high where they are having pre-existing damage to the roots and or where they get stressed. Take particular caution especially with trees having recent wounds more so, birch, and apple, maple, elm, willow and spruce trees. This is a disease predominant with aspen trees. It manifests by forming brown spots characterized by yellow rings on tree leaves. After this early signs, the resulting effects are leaves decaying and dropping prematurely during summer as opposed to typical fall. This infection weakens trees resulting to further problems. If you spot this problem, be sure to contact a Colorado-area tree surgeon to have it taken care of before it spreads to more problems. A fungus which grows as a typical white mildew on any tree surface, it affects numerous shrubs and trees. This mildew affects normal photosynthesis and inspires a host of other further problems. Shoot Blight is a disease caused by a characteristic fungus which is surprisingly absorbed by trees through their leaves. It mainly chokes the tree branches. It mainly manifests through dark spots that appear on the tree leaves which is followed by prompt death. When it advances it can result in branches curling into a distinct �shepherds crook’. With respect to Aspen trees, it mostly spreads during heavy rains and warm temperatures. The list of tree diseases is wide ranging and also includes Needlecast, Fire Blights, and Anthracnose. For anyone that has witnessed a dying or already dead tree falling especially on their premises has a firsthand experience with the dire repercussions tree diseases can inflict. When you spot any unusual manifestations or signs, a qualified arbotist is the best individual to examine and determine the most appropriate solutions. Everyone loves trees, not only because of the shade it gives us, but also the beauty it brings to the environment and nature at large. Street tree play a major role in the community and requires maintenance every now and then. In Denver, Colorado, property owners are mainly the people responsible for taking care of the street trees. But in real sense they(the trees) are owned by the Denver residents. To enable proper maintenance of the trees the government has place rules and regulations to be followed while pruning,planting or removal to meet the required ISA standards. On the other hand, if you have private trees such as those in your backyard, you will have fewer regulations to adhere to. In this article we will look at Guidelines for street tree maintenance, regulations and laws in Denver, Colorado. Always get a permit if you are planning to plant/remove a tree near your home or to trim it. This is to avoid trees being cut off with no reason leading to destruction of trees. The permit is usually free of charge hence you not incur extra cost while getting it. The guidelines for pruning a right of way tree are usually the same as that of the licensed tree service, who can also be hired to maintain the trees if need be. Some of the trees may be harmful to you and the surrounding hence it is your responsibility to identify them and have them brought down. If you encounter a dispute with your neighbor about any street tree, the matter can be settled in a civil manner or through an intervention from the city arborist. In most cases this happens if the tree is an imminent structural hazard. Legally the pruning cut must be on the outside branch-collar in the following order: first there is an undercut which is about two feet apart, the second cut at the top is a bit further out from the branch collar, while the final cut is done at the front of the branch collar removing the other two foot stub. It is crucial to note that the saws used for pruning are often sharp hence no one should sit under it during the process. The evergreen types of trees are not allowed when planting trees in the right of way, as they cover or block the site lines. However, there are other types of trees allowed for shade such as the Kentucky Coffee tree, English Oak, Hack-berry, Texas Red Oak, Bur Oak, Catalpa, Chinkapin Oak, Japanese Pagoda tree, Sycamore and the Yellow-wood tree. If you are planting a street trees you are required to space the as follows; the ornamental-trees should be about twenty five feet apart and the shade-tree to be approximately thirty five feet apart. All other trees should be about twenty feet from the street light, ten feet from the drive-ways, alleys or seven feet from sidewalks. Trees play an important role in our environment and should not be overlooked. The rules and regulations place protecting the street trees during planting, pruning, remodeling your home, or landscaping should be followed. Above all do not attempt to take down or remove large trees on your own, it is a very dangerous job that needs to be handled by an insured tree company. Damages to these trees may lead to you receiving an administration citation or a fine by the City Forester’s office. All this can be avoided if you follow the above pointers. For more information about the regulations and guidelines contact Denver Forestry or visit their website. Beautiful trees do much more than enhance our landscape. They also improve the very quality of our lives by shielding noise, creating oxygen, increasing curb appeal and overall property value, while providing vital shade for our homes, enhancing our homes landscape, gardens, and lawns appeal. Over the years, we have become the No. 1 Arborists in Denver due to our expertise and knowledge on what it takes to grow healthy and fruitful trees in our semi-arid Denver, Colorado climate. We take great pride in our unparalleled reputation as leading tree care experts. In a field that is riddled with unscrupulous wannabe tree specialist, our longstanding customers are a clear testament to our dedication to offering honest and above board service. – Tree and shrub fertilization. – Tree and shrub trimming and pruning. – Treatment and disease outbreak curbing. 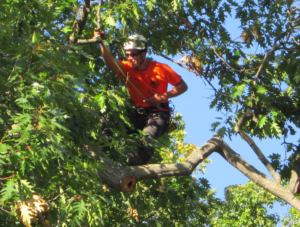 What to look for in a tree care specialist in Denver, CO. is a common question by most tree owners. These essential tips will help you to navigate through the dozens of tree experts listings and finally find a professional company. A tree specialist is worth his experience. Experience acquired through grueling hours of dedicated tree care services through storms, winter, heat, and diseases. Settle for a tree care specialist who has enough experience providing care services to a broad range of trees. Accidents either of a personal or property nature are very common in this industry. That is why a tree care specialist company should have a comprehensive public liability cover and a personal accident and workman compensation insurance for its staff. These two covers indemnify you from any claims in case of an accident while any work is being done on your trees. Emergency services will always come at a premium. However, if you have a tree leaning dangerously against your home or it’s blocking your driveway after a storm, then you need to have it removed immediately. Settle for a company that provides 24 hours a day, 7 days a week emergency services. A tree care specialist company MUST have the requisite tools and technology to handle any work. 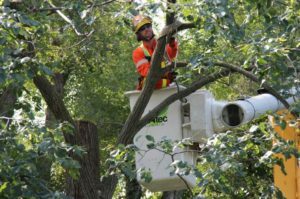 Tools include; bucket trucks to handle tall trees, track loaders for clearing root networks, aerial lifts to access trees overhanging buildings, spikes to climbs trees, cables, chippers, chainsaws, and stump grinders. A qualified, professional tree care specialist will add valuable life and health into your trees. Make the right choice, choose wisely. Your trees will outlive you.